Something like the sea urchin and saffron, coriander and parsley foam, above. From a series of photographs by Bob Noto, and a dish from the French restaurant, Mirazure, this is utterly ridiculous, and perfect. 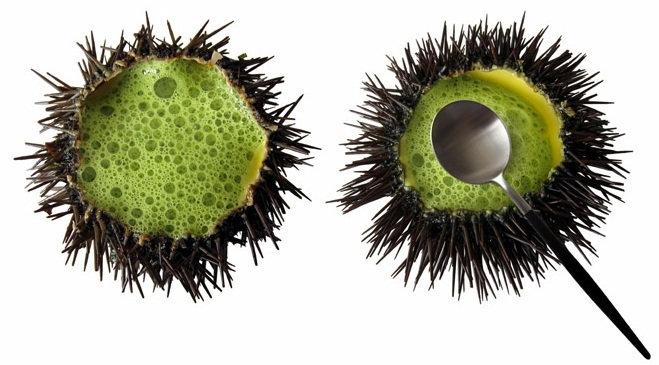 I’ve no idea how it would taste, I don’t have any handy edible sea urchin shells lying around with which to experiment myself, and in all honesty it’s probably too much of a bother to actually qualify as food, instead of a piece of edible art – but I like it. So, I continue to look for alien, or science-fiction foods – not of any particular piece of media (belay that command for Earl Grey, hot, and I’ll do without any Soylent Green substitutes, thankyou) but food that just seems odd enough that it could have a story all of its own. I’ll write the story afterwards, but the food comes first, in this situation. Oh, and don’t even talk to me about freeze dried ice cream – yuck. I once had live baby fish in sake. You drank the Martini glass captured concoction before the baby fish died. The restaurant was most particular about this. A waitress stood in overwatch pose until the wriggling, dying, little things slipped down your throat. It was at restaurant called Hump in Santa Monica, famously shut down after it was caught serving rare whale meat weeks after the ecofilm, The Cove, made a splash in the US. Truly, it was disgusting. The dying fish, I mean. « What Secrets Do The Plastic Gods Whisper?